Discussion in 'General Discussion Subforum' started by Alan Gordon LCSW, Jul 20, 2017. To the amusement of most of my friends, I still use a flip phone. I can’t send or receive pictures, and emojis come through as little boxes. But the most interesting thing – for those of you who can remember back to 2005 – is that there’s a limited amount of storage space for text messages. Once I hit 200 texts, I need to “delete all,” or no more will come through. You can bet that I’ve never hit that 200-mark…no one wants to miss a text. When we’re incentivized to pay attention to something, we'll pay attention to it. You pay your bills on time to maintain good credit. You fill your car with gas so you don’t get stranded. You cut your hair regularly to keep it looking nice. But there’s one thing you probably neglect that is more important than anything else, and it’s at the heart of your pain. It feels wonderful just to be checked in on. It can make you feel cared about and attended to, and can remind you that you matter in this world. But many of us don’t check in on ourselves, and this subtle self-neglect can actually have many physical consequences. I’d like you to try something as you’re reading this: check in with what you’re feeling in your body right now. Are you aware of feeling any physical sensations? Possibly in your chest? Or your stomach? Or your throat? If so, how would you describe this sensation? Is it a tightness? A clenching? A fluttery feeling? Is it warm? Is it tingling? And as you check in, just notice, is this sensation pleasant or unpleasant? Is it widespread or is it in one specific area? You're just checking in. You don’t have to do anything with this sensation; you’re not trying to make it go away or move it. You’re just watching. And what do you notice happening as you pay attention to this sensation? Does it intensify? Does it subside? Does it expand or contract? Does it move to another part of your body? Does it stay the same? Whatever it does is okay, you’re just watching it; following it. You don’t have any ulterior motive, you’re just paying attention to this sensation in your body, with pure curiosity. You’re just an observer right now – paying attention, noticing what’s going on inside of you, and checking in. Congratulations. You just did three important things: you attended to your internal state, you treated yourself with love, and you gave your brain the message that it’s safe. You may have heard of Mindfulness. Many people associate it with meditation or eastern philosophy, but it’s actually a very simple idea. Jon Kabat-Zinn, who helped popularize Mindfulness in the West, defines it as "paying attention, on purpose, in the present moment, non-judgementally." And that’s exactly what you were doing as you attended to your internal state. It’s not complicated, but it’s very powerful. The most effective way to communicate a message of safety to your brain is to mindfully attend to the physical sensations in your body. We call this Somatic Tracking. Neuroscientists have found that mindfully attending to our bodily sensations can actually shrink the "fight or flight" center of our brains. Furthermore, this practice enables us to have better control over our brains' processing of pain and emotions. Somatic Tracking is the most important component of overcoming neural pathway pain. When you attend to your physical sensations mindfully – without fear, without judgment, and without motive – not only are you communicating safety, you’re giving yourself the message that you deserve to be treated in a loving way. In the coming days, we'll discuss how to use Somatic Tracking to regulate your anxiety, reduce the fear around your pain, and help you feel your emotions. When I was a sophomore at UCLA, the Dalai Lama came to speak at our school. I was an economics major at the time, and had little interested in psychology, but it was only a block away from my dorm, so I went out of curiosity. Along with 17,000 others, I piled into in Pauley Pavilion to hear him speak. It was incredible. He talked about the barriers to self-love, the pursuit for inner peace, and the importance of disciplining the mind. At one point he spoke about meditation. “People I talk to in Beverly Hills,” he said, “meditate for only an hour a day…” And then he started laughing. 1. What the hell am I doing majoring in economics? 2. 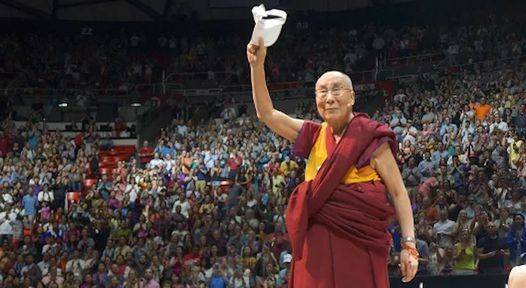 The Dalai Lama has some seriously high expectations when it comes to meditation. It wasn’t until years later that I realized what he meant. If we attend to ourselves for only an hour a day, then we’re neglecting ourselves for the other 15. Of course, unless you’re gunning for spiritual enlightenment, you’re not going to attend to yourself every moment. And that’s okay. But with practice, it can become more of a default setting, and you'll develop the neural pathways for mindfully attending to your internal state. All you need to do is check in, and pay attention. Looking for space, cdub, Bodhigirl and 17 others like this. I accidentally did a version of this yesterday morning. I have noticed that if I stay in bed past a certain time, my body starts to hurt. Slowly at first but it gets worse as time goes on, until I get up. When I woke up, I didn't want to get out of bed. It was my day off and I wanted to sleep later. But I could already feel it starting. And I realized that I also had that fluttery, restless feeling I have when I am anxious or nervous. But I didn't want to get out of bed so I just laid there and just sort of watched as the anxiousness increased then dissipated. Then the pain kicked in, starting with my shoulders, then spreading down my back, settling in to where the base of my spine meets my lower body. I didn't do anything other than some deep breathing. I fell back to sleep for about ten minutes and woke up. It was all still there but at a much lower level. I certainly didn't realize what I was doing, but it was interesting, because I've never really "felt" that anxious feeling that precedes the pain. Its good to know its there, and that I can feel it now. raindear60, Oscar B., frenchgazelle and 10 others like this. Thanks for this great clip. danielle, James59, Benjuwa and 1 other person like this. Such an insanely gorgeous post. 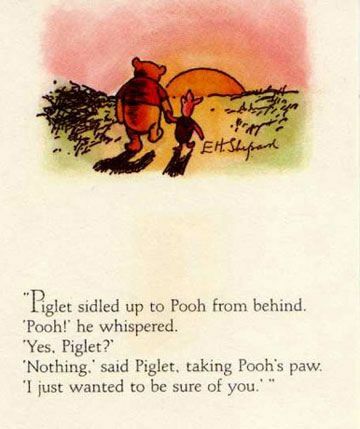 I love the Pooh and Piglet image for the way it assures the reparenting of innocence in such a simple way. It reminds me that healing can be engaged in with childlike wonder and fun. One of the methods I developed to self-soothe is to imagine an archetypal Mother figure who holds me close and safe when needed. I'm also profoundly reassured to hear that tuning into your body is an integral aspect of healing. I have long being troubled by suggestions that one should ignore the body. It went against every instinct and experience I have had in recovery. Thank you for utterly demolishing that nocebo. chemgirl, Emerald, Celayne and 8 others like this. I am checking in with myself. I wish it felt like Pooh's paw. It feels cruddy-a brick in my abdomen. How long should I pay attention? I have spent a lot of time running from this sensation and the anxiety. Thanks for the help. Kevin Barry and Denise84 like this. JJ, that's fantastic. Attending to these sensations - free of fear - is one of the nicest things you can do for yourself. HS, as you pay attention to your anxiety, you gradually increase your capacity to tolerate anxiety. Keep it up, it gets easier. Thank you, Plum. Most people - either with or without intention - ignore the anxiety in their body. This is the opposite of what we should be doing. Michele, the goal is not having a goal. You're doing great. You're simply an observer, watching these sensations. With time, you're able to increase your capacity to tolerate anxiety, teaching your brain over time that these symptoms do not mean danger. AC, insomnia is actually the consequence of general anxiety. I'll be answering the question you asked in tomorrow's post. schnurma, CarolAnnie, plum and 1 other person like this. Any ideas how you can attend to and sit with anxiety if you're worried about the effect it has on your heart rate and blood pressure. Iv had some success with sitting with anxiety, but at times when it seems constant, the fear of it doing my body damage maintains it. Ollin, Benjuwa and Bodhigirl like this. Thanks for putting this together. I think it's been the missing link for me. I've read books, done the SEP, check in on the forum but there's still a ways to go as in something has been missing but I couldn't figure it out. I would feel my emotions and be aware of what's causing tension but I would still feel pain. Particularly, in the morning. I wake up and there's a blissful 30 seconds of no pain and then bam.. headache sensations. Followed by anxiety. Earlier on you taught us about danger signals and how our brain scans for danger. That's what I was doing but I didn't realize it. Since I've learned this about a week ago I've warded off 2 headaches. I went through my menstrual cycle with no headaches. No pills, no anxiety pills. I've only done that 1 other month this year. I keep telling my brain "the sensation you feel is just a sensation. It doesn't mean danger. It's ok, you're safe.." It's been working. What's strange is I remember reading this but I guess it just didn't click so I feel like I've come across a valuable piece of knowledge. Thank you so much. Follow your gut people. When I feel like I'm not getting it something tells me to check in here but sometimes I would feel guilty because I'd think to myself that I'm just not letting go and I'm TMSing by coming here but you see, I needed to. Why do we beat ourselves up? I feel really grateful to have come across this forum. It has truly saved my life. Where I was a year ago until now is astounding to me. I almost feel normal again. Treedreams, Amatxu, Lainey and 8 others like this. Alan, Forest and everyone involved in this forum: you're amazing! Thank you! Such a great fundraising idea. I was constantly tense as a child because of my father who I was afraid of. This tension all over my body was added by debilitating fatigue and pain over time and with 44 is still there every day. When people ask me how I feel I usually don't know what I feel. Besides tired, tense,weak, pain, I guess. As a teenager I played the cool kid. Everybody believed that fassade. Inside I felt tiny, afraid, weak, unlovable, crazy, broken. I didn't show it. On the outside I was the guy without problems, for decades. When I'm even more anxious than usual I have sweaty palms, increased heartrate, heart pain and don't sleep. A friend just massaged me a little and was surprised by how hard my muscles were. She recomended massages. Do they make sense besides the 'brain work'? Why a nice massage if I try not to care about the pain? WildforWesties, Lily Rose, Ellen and 1 other person like this. i suspect this is similar to the "feel your emotions" tool that has helped so many. I always thought i was stuck because whenever i tried to feel inward, i only ever felt anxiety (a tight bulging tense feeling in my chest, throat, and sometimes belly) and i was always led to believe that anxiety was a "false" emotion and i needed to find what was behind, or causing it. It made me want to give up because i could never feel anything but fear/anxiety, and that was blocking the emotions i was supposed to be feeling. Now i know it's ok to feel anxiety, and it's valid. Thanks. Lainey, Lily Rose and Bodhigirl like this. This was my favorite segment, so far. I took a training in somatic experiencing years ago with Levine and do similar work yet so lovely to hear it from an external voice, Alan. I felt so reparented in closing my eyes and just receiving instead of giving it to myself, alone. Am especially grateful for the Pooh art. suky, plum, Lauren T and 1 other person like this. I had an angry father, too and he still resides inside me at a cellular level. I find massage and self-massage, Rolfing and body tools for deep fascia releases enable me to access unspoken parts of me that generate fear, apply pressure to be perfect. Years ago a therapist pointed out that I wasn't breathing. I held my breath, on and off, for nearly 30 years. Massage allows for breathing and releasing in the safest ways. I believe therapeutic touch is another form of the re-parenting Alan references above and in the demonstration video. It's not a cure but it is surely never harmful, at least not in my experience... half a lifetime on this path of healing from the first half. plum, Lily Rose and UnknownStuntman like this. Thank you Alan. I really enjoyed this one. I have been checking in with my body several times a week to see what I am experiencing- but it was more like a chore. The way you described it in your video is what really clicked for me - saying that you werent listened to as a child and had to take care of other people's needs so I you never learned to even consider your own and that checking in with your body is a way to show yourself that you care and you are taking an interest in caring for yourself and making sure you feel safe - that made sense and so when i started doing it again today it felt different and I was more opened to the experience. I received a phone call today and I was about to lie down to rest by back because I had been up for several hours and had done alot. But, I didnt want to disappoint my girlfriend so I stayed upright and started cooking which requires standing which is difficult for me. After about 45 minutes, my back pain started with leg pain. When my lower back hurts it feels like intense pressure and pain and tingling in my legs like I am ready to collapse. This feeling scares me because I have had this pain for several weeks to where I cant get out of bed. So I tried this time just checking in and describing the pain and just sitting with it in a caring way - very different than what I had been doing - thank you Alan! MWsunin12, plum and Lily Rose like this. Are you aware of feeling any anxiety? If so, where do you feel it? Do you feel it in your chest? Your stomach? Your throat? What if what we are feeling is pain/discomfort and not anxiety as such? plum and James59 like this. I to have been waking up about an hour before I wanted to with anxiety that has been turning into pain, yesterday I used a 60 min sleep meditation that I use to go to sleep and did fall back to sleep about 20 mins and my anxiety was so much better yesterday. When this happened this morning it did not work so well the sleep meditation I even stayed there counting my breaths to about 200 and still having a high anxiety day I even did a 40 min meditation (Body Scan) about 2 hours later and that did not help much ether. Only thing this does is help keep the anxiety from turning into a panic attack. So I do mindfulness walking and breathing though out the day. Anyone else have problems in morning when waking up? I don't understand how checking in on ones feelings of anxiety communicates safety. One of the main things about TMS I guess is that the fear of tissue damage causes the fear, and tissue damage is not going to happen, so we don't need the fear. But what if the fear isn't about tissue damage, but simply about the pain? I limit my activities because I don't want the pain to escalate, which it usually does. caligirlgonegreen, Sprocket, editrix and 2 others like this.